We’re now down to two baby Herring Gulls having started out with three, then, plus two, making a group of five. Of the three no longer present I can see that one of them died and the baby gulls have been feasting on the carcass. I don’t know what happened to the other two. 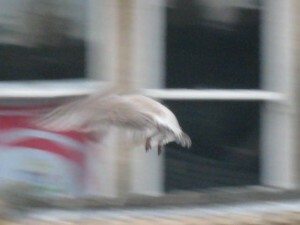 The baby gulls have reached the stage where many of them are learning to fly and leaving their nesting area. For example, the remaining two baby gulls we’ve been watching race around the flat area of the roof, spread their wings, flap madly, make a lot of noise and, particularly when it’s windy, raise themselves some 4-6 inches off the ground, well, the roof. The Old Town is busy with baby gulls who have left their nests walking around the streets, making short flights and learning how to survive. Quite often I see parent gulls looking after their offspring. Many of them congregate at Swan Lake, a boating lake on the seafront, which functions, essentially, as a creche for baby Herring gulls. If they can make it there, well, I think they’re going to be alright.